What to do with two foldable screens? Are folding smartphones the devices of the future? Rumor has it Samsung could debut a new type of smartphone at MWC at the end of February, in the form of the Galaxy Q. No, not the 5.3-inch Galaxy Q that popped up in 2011 - this one's got dual 1080p AMOLED displays that fold together and unfold seamlessly, according to Slashgear. The video below, from 2008, reportedly shows an early version of the technology used to make the Galaxy Q's two screens fit together without a break. It looks pretty incredible, though back then it wasn't quite ready for public consumption. According to reports on Monday, though, 2013 will be the year that Samsung's folding smartphone finally makes its consumer-facing debut. The folding Samsung Galaxy Q popped up on Saturday at MobileGeeks.de when a reader tipped the site off to GLBenchmark's tests of a device with the model number GT-B9150. The results reportedly match the Galaxy Q, indicating the folding phone could be nearing release. If that's the case, a debut at Mobile World Congress 2013 in Barcelona seems likely. The GLBenchmark report and previous rumors suggest that the Galaxy Q could feature two 5.3-inch 1080p AMOLED displays, a 1.7GHz dual-core Exynos processor, 2GB of memory, 8- and 2-megapixel cameras, and a 3500 mAh battery, according to SlashGear. 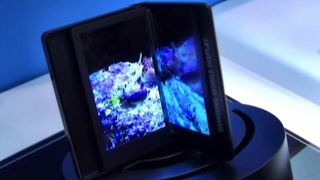 The Galaxy Q might utilize Samsung's flexible OLED display technology as well, though that part of the story is muddled. In fact, everything about the Galaxy Q seems muddled at this point. Hopefully Samsung will lift the curtain at MWC and introduce the world to what could be the next evolution in smartphones. We'd sure like to have a try at folding it in half.